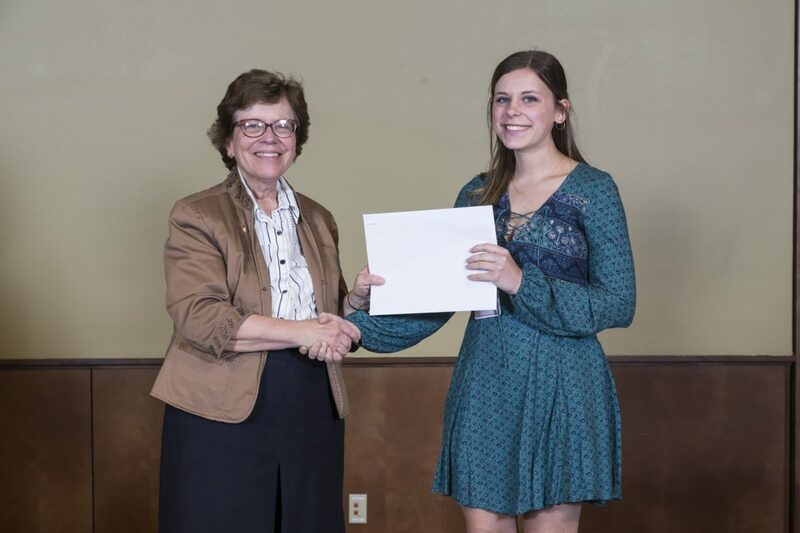 Tess Carlson receives a Hilldale Research Fellowship from Chancellor Rebecca Blank at the Chancellor’s Award Ceremony in Spring 2018. Tess Carlson, a UW-Madison chemistry major, came to the university from Hamilton High School in Sussex, WI. She received the American Chemical Society Hach-Land Grant Scholarship in 2016, designed for undergraduate students who plan on teaching high school chemistry after college, and a Hilldale Research Fellowship, for her single-molecule research project in the Cavagnero Group. What led you to the University of Wisconsin-Madison? I grew up in Wisconsin and always knew about the well-respected reputation of UW-Madison. My older brother also attended UW-Madison a few years before I began here and had a great experience. The rigorous academic programs and research opportunities here, paired with a lively and fun environment, all on a beautiful and urban campus, helped me ultimately decide on the University of Wisconsin-Madison for my undergraduate years. When did you decide to pursue chemistry and why? I decided to pursue chemistry while taking high school chemistry courses. These courses consistently challenged me, but I found the concepts interesting and important. I also found it very exciting to make connections between other areas of science or everyday objects and chemistry. Around the same time, I decided that I wanted to become a high school teacher. I settled on chemistry as my subject to teach because I enjoyed it so much and knew many students struggle in this area and would benefit from a passionate, dedicated educator. Along with chemistry research, I am very interested in current topics in education research. In the future, I plan on becoming a high school chemistry teacher in an urban area. Outside of chemistry, I love travelling and spent the summer of 2018 studying abroad in Croatia. I have participated in research in the Cavagnero Group since January 2016. We study protein folding in a cellular context. My current research project involves the design and assembly of a single-molecule custom microscopy apparatus. This custom instrument will be used for Förster Resonance Energy Transfer experiments to examine the various conformations of newly-synthesized protein chains bound to the ribosome. The PI of my research group, Silvia Cavagnero, has been instrumental in shaping my research experience as an undergraduate. The independence that she has offered me in my project has given me confidence in myself as a scientist and researcher, but her patience and guidance along the way have allowed me to accomplish a great amount during my undergraduate years. After graduation, I plan to earn my Master’s Degree in Secondary Education and become certified to teach high school chemistry. I am especially interested in secondary education in urban settings and would like to teach in a high-need district.